This dish is one of my favourite Chinese New Year dishes. It’s delicious, simple, super quick to make as well as really colourful. This dish is especially perfect when you have many dishes to prepare for your Chinese New Year banquet as you can make this dish really quickly. A great thing about this dish is you can easily get hold of all the ingredients in your local supermarket. You don’t even need to go to Asian or Chinese supermarkets to buy any ingredients. The one exception is rice wine but dried sherry is a perfect substitute. “Sixi 四喜” in Chinese language means “four happiness” or “four lucky or joy”, which also means a lot of happiness. So as you may be aware, Chinese people love to serve dishes with lucky names or meanings in their banquets. So this is a really popular dish in Chinese cuisine. In this recipe I used carrots, red and yellow peppers as well as mange tout. But as with many Chinese dishes, you can always use other vegetables instead such as peas, green peppers, baby corn. Personally I like my dishes to be quite colourful so I will always recommend using vegetables that will make this dish more colourful, but this is entirely up to you. You can also adjust the amount of vegetables you use. I use quite a lot of vegetables in this dish but if you want you can cut down the amount of vegetables you use. You might want to adjust the amount of seasonings used as well to suit your personal preference. Marinade scallops with rice wine or dried sherry, salt and ground white pepper. Add carrot and keep stir-frying for 1 minute. Add yellow and red pepper and stir-fry for 30 seconds. 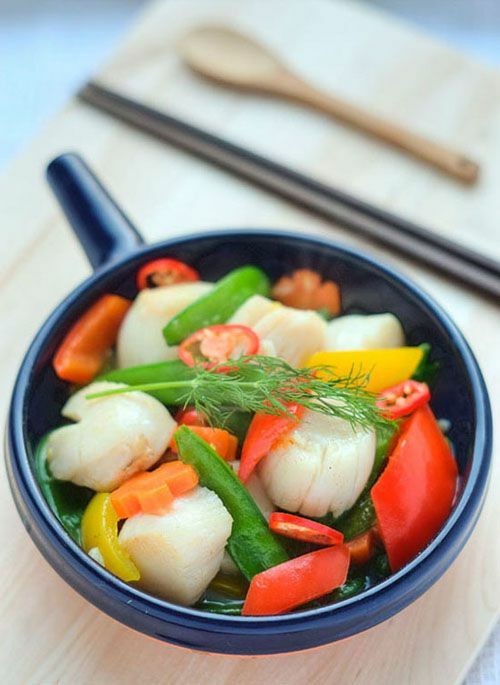 Add scallop and gently mix evenly and stir-fry until the scallops are cooked. This should only take a couple minutes but it depends on the thickness and the size of your scallop. Stir in potato starch water and bring it to boil again. It’s now ready to serve. *(1 tablespoon potato starch or corn flour water: 2 tablespoons cold water, mix them evenly before pouring it into dish). This is for “slurry” for which you can click on the link and read about.